This is a variation of Understand How to Be Responsible #2. Explain to the girls that you are going to pretend to be the town council of the first colony on the moon. Explain how on Earth, most laws come to be because people perceive a problem and set up a law to prevent it. Have each patrol discuss what problems they thought a Moon colony might have and what laws they would need. We had each patrol present their best two ideas but if you have a small unit you might want to let them present more then that. Once all the laws were written on a piece of chart paper, each proposed law was considered by the whole council. The girls had a chance to discuss and ask questions about the law. The patrol that presented it tried to defend their idea. Then everyone would vote. This is a nice project for Understand How to be Responsible #5. Cut your nylon stocking into pieces. We found we could get six piece from each pair of stockings, three from each leg. If you don’t have the toe, tie one end with floss or thread and turn the stocking inside out. If you have a toe you can skip this step. Place one tablespoon of grass seed in the stocking. Fill the stocking with a cup or so of soil. Tie the bottom of the stocking with more floss or thread. Pull out one clump of dirt and wrap floss around it to form a nose. Use white or hot glue to attach the eyes. You can add felt, pipe cleaners etc to create eye brows, bow ties, etc but don’t cover the top of the head. Place in a cup and keep damp. The grass hair will grow in about a week. 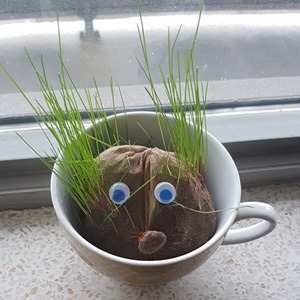 You might want to warn the girls to keep their grass heads away from pets as in our unit we had at least one grass head given a hair cut by the family cat. I got this idea from Bluenose Guider’s blog where she used it to talk about etiquette when selling cookies at a Cookie Rising Meeting. I immediately used the idea for a discussion on netiquette during a meeting about being responsible online. But the game could be used for many occasions when there is a list of dos and don’ts. For each item on the list of dos and don’ts write it on a clothes pin but leave off the Do or Don’t. For example: If you want to say “Do say please and thank you” then on the clothes pin you write “say please and thank you”. You need to make one set for each patrol so if you have 4 patrols you will need four clothes pins with “say please and thank you” on them. To make set up easier, assign a colour to each patrol set and flip the clothes peg over and put a coloured dot or line on each one. Then you can easily sort out each patrols set. Finally, make one sign per patrol that says Do on one side and Don’t on the other. Have the girls line up in relay race lines at one end of the room. On “go” the first girl from each patrol will run to the pile of clothes pins and pick one up. She will then run to the end of the room and read her clothes peg. If she thinks it is a “do” she will clip it to the “Do” side of the sign. If she thinks it is a “Don’t” then she clips it to the “Don’t” side of the sign. Then she runs back to her patrol and tags the next girl. Once all the teams have pinned all their clothes pins to the signs, have them discuss their choices. This is an activity originally designed by Hollah Guiding for Understanding the Promise and Law. I was able to reconstruct her original sheets and modify them for my own use. Each patrol will get one Be Prepared kit for designed for a trip to a destination. The destinations I decided on where school, the movies, a sporting event, sleepover and a picnic . When the patrols come back together in horseshoe, they have to defend their be prepared kit and explain why they include each item. A terrarium is a sealed indoor garden. Once set up they require little maintenance. Most of my house plants are in terrariums because I’m not a very good plant mom. They are a great project for discussing ecosystems, water cycle or the care of plants. They also make great gifts. Clean large glass jars. 1 per girl. I like to use 2 l jars like the ones Costco sells pickles in. Smaller jars will work but I wouldn’t go less then 1 l.
Step 2: Put about 3 cm of pebbles in the bottom of the jar. This is for drainage. If you are using charcoal you can put another cm of charcoal down and then mix it with the pebbles. The charcoal helps to prevent your terrarium from smelling like a swamp. Step 3: Fill the jar at least of third of the way up with soil. Pack in lightly. Step 4: Plant a small plant in the middle of the soil. In these small terrariums you should stick with just one plant. I’ve found that large box home improvement stores often carry suitable small plants for a dollar or two and a single plant may be separated into two or three parts of the girls. Make sure you buy plants that are small enough that they will have room to grow in the jars. The plants must be able to tolerate most conditions. Ferns and mosses do well as do ivies, poke-a-dot plants and spider plants. Step 4: Decorate. You can add rocks, shells, or miniature figures as decoration. You can also pant or decoupage the lids of the jars. Step 5: Water and then screw the lid on. You only need to add a little water. Maybe a 1/4 of a cup and you won’t need to water again for 6 months if the jar is sealed up. If too much water is added and the jars have a lot of condensation on the inside a day or two later, just unscrew the lids for a couple of hours to let them dry out.